To strengthen communities and inspire stewardship of local ecosystems in the Puget Sound watershed through volunteer work. The Seattle Clean Street Collective hosts cleanups once a month on Saturdays from 10AM-12PM. The location will vary by month. To stay up to date with each event, subscribe to their mailing. Events typically start with breakfast and introductions before heading out for an hour and a half of street cleaning. 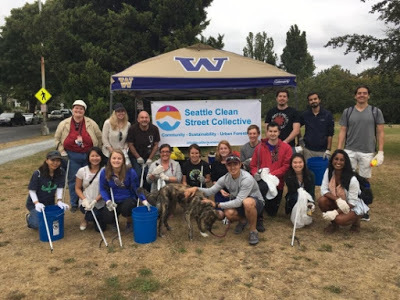 The Seattle Clean Street Collective is a dynamic group of volunteers brought together from various neighborhoods in King County to educate and inspire environmental cleanliness and health. The team works with volunteers to keep our streets clean and beautiful. They conduct bi-monthly clean-ups throughout Seattle, where they collect trash and debris for proper disposal. In December 2016, Seattle Clean Street Collective reached out to Groundswell NW for a microgrant and to help with outreach to the NW Seattle community. Groundswell NW awarded a $500 microgrant towards purchasing custom t-shirts, fluorescent safety vests, an A-frame sign, and promotional yard signs. On April 9, 2017, The Seattle Clean Street Collective hosted a cleanup event at the Ballard Locks and will be hosting future events that will be posted on our events calendar.